The Star Fraction is a science fiction novel by Ken Mcleod. This is the first book by MacLeod that I've read but certainly not the last, not just because I've already bought The Stone Canal and The Cassini Diversion, but because MacLeod is a damn good writer. I mostly picked up these books on the advice of the good people of alt.books.iain-banks and the similarity to Banks is hard to deny. If you like Banks there's a good chance that you will enjoy MacLeod to. 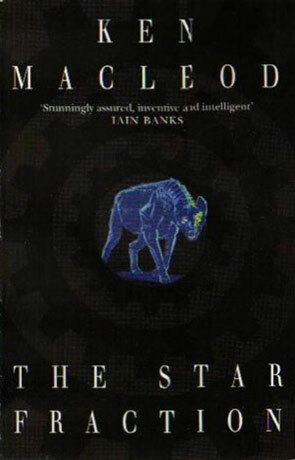 It's interesting to note how and where there's similarities between their books, when you remember that Banks and MacLeod are good friends and if I've understood it correctly went to school together. Let me make one thing clear: While they do have some similarities MacLeod isn't Banks the Second or Banks Jr. And I mean that in the most positive way. And while it's impossible to do a direct comparison between the two, I think that if The Star Fraction had been written by Banks I would probably have rated it as one of his best. The story of the Star Fraction is rather convoluted and hard to summarise, but the main character is the mercenary Moh Kohn (or maybe it's his rather special Gun). There's a couple of secondary character that's also important, but in some ways the characters are not the important thing here, not that the characters aren't interesting, but the world of The Star Fraction, was for me the most interesting and refreshing thing about this book. It takes place in an England that has been divided in to a lot of small autonomous states. Some anarchistic, some capitalistic, some socialistic and a lot of -istic's that I had never in my wildest imagination imagined. MacLeod (or at least his characters) has some interesting views on politics and the book is worth reading for these musings alone. With the added action, the inter character frictions, the world as we know it ramifications and the quite funny references to this day and age, MacLeod has a winner on his hands. Written on 30th August 1999 by TC.